Xie Shichen (1487-ca. 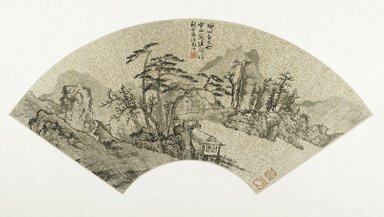 1567) Streamside Pavilion in Pure Autumn Signed Xie Shichen and dedicated to Shaoshan. One seal of the artist. Two collector's seals. Landscape with figures in small hut at center foreground. Poem at center. Condition: Slight abrasion and loss of ink along ribs of fan where it was folded. Possible inscription at upper right corner that has been erased.